People often marvel at the fact that some clocks not only keep time but also show additional features such as the day of the month and even the state of the moon and the tides, even occasionally tides in several different places. This is not rocket science, though it comes as a surprise to those not accustomed to antique clocks. Even some of the very earliest clocks of the sixteenth century would show moon phases, the moon's age, and often too zodiacal indications, planetary conjunctions and the like, for at that time such clocks may have been more prized for use in astrology than in astronomy or timekeeping. They may not have known what time it was, but they certainly knew where the stars were, and how their destinies were determined by them. A lunar cycle takes approximately 29 and a half days each lunar month from full moon back to full moon again ( the actual time of a lunation is 29 days, 12 hours, 44 minutes, 2.8 seconds), and does not vary. This means that a clockmaker had only to devise a means of pushing on the moon indicator one point forward every day, plus an extra half point once a lunar month. In fact this was achieved by having the indicator knocked on one unit every twelve hours (two units per day) with one extra unit at the month end. The wheel that drove that would need fifty nine teeth, each tooth nudged on by a lever every twelve hours. However a moon disc with two complete lunations was normally used - 118 teeth - and that would show the moon's age consistently. A monthly calendar on the other hand had to try to register months of unequal length ranging from 30 to 31 days, even sometimes 28 or 29 days, and that was a far more complex affair than a moon dial. A self-adjusting calendar indicator was possible and certain very skilled clockmakers did make them. But it was complex to make and even more complex for the owner to handle and re-set. Consequently it was usually avoided, and the owner was left to adjust for himself the alternate months - usually by pushing forward the indicator on a short month from the 30th to the 31st, so that the next month would start as normal on the 1st. So if a day of the month calendar was messy because of the irregularity of the number of days in the month, a lunar calendar was relatively easy with its constant 29 1/2 days monthly. Full moon is on the 15th lunar day, when a moon dial will show a full moon's face. A new moon (in fact no moon at all for one day) on the 291/2 to 1st is shown by no face at all (or on some clocks by a black moon face compared to the white face of a full moon). In a normal moon dial such as that called a 'rolling moon' in the arch of a longcase clock, the quarter moon shapes, waxing or waning (rising or falling) tend to show the correct shape by part of the moon's full face being obscured by one of the two moon 'humps' on the dial. The moon's visual age, as seen in the shape of the visible part circle, is called the moon's phase. All moon dials also show a number alongside the phase to indicate the actual lunar date. A lunar date is something quite separate from a calendar date, though occasionally they will coincide by chance. The moon's movements, for our purposes, are constant, though I am sure astronomers could tell us otherwise, and do. As the tide is determined by the moon's gravitational pull, tides remain constant too, for a certain lunar date. This means that once we know the tidal times for a certain port, they will be the same the next lunar month. It is therefore relatively simple for a clock with a moon dial to incorporate tidal times. That is the simple principle of it, but nothing in science is ever simple really. Someone who knows such things once told me that the moon's gravitational effect varies according to whether it crosses huge land masses, like the Welsh mountains, or a flat surface such as the open sea, and the difference in the tidal pull amounts to several minutes. No doubt the tidal times as determined by local knowledge at any particular port, and as probably set down in a local tides chart, would take account of the actual tidal times, and would therefore include any such effect, even though the chart-maker was unaware of it. 1. Conventional 'rolling moon' of the early type with the 'starry sky' background made about 1750 by Daniel Seddon of Frodsham, Cheshire. Here showing the 18th lunar day. Closer view. 2. 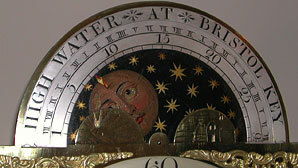 Rolling moon of the early 'starry sky' type dating from about 1760 by Charles Horwood of Bristol, Somerset, but here incorporating the tidal times to show High Water at Bristol Key. Here the dial shows the 7th lunar day with high water at 12.30. Closer view. Tides however do not fall at conveniently uniform time differences for each successive day - some days the difference can be anywhere between half an hour and one and a half hours, and these may further vary with the months of the year. The clockmaker could not conveniently make his clock vary daily by such disparate amounts. Instead he 'averaged' out the daily tidal time difference. This means that a clock does not show High Tide (i.e. the maximum high tide or 'turn of the tide'), but shows what is called on most dials 'High Water', which means the tide is near to full and high enough to set sail, or pull into harbour, or set off up river. Some moon dial clocks would also incorporate a tidal dial for the 'home' port, so that a Newcastle clock might carry indication for high water times for an unspecified port, which would in fact be Newcastle. More often the place would be specified such as 'High Water at Bristol Quay' or 'High Water at London Bridge'. Moon dates were numbered in Arabics 1 to 29 1/2. Tidal times were usually lettered in Romans I to XII, with quarter hour units shown too. On a clock with tides for the 'home' port, a single pointer would read off both the moon's age and high water for that day. But some clocks were made at places well inland, perhaps places which are not even tidal. Why? Several reasons. Some places were open to seagoing ships in the past, which no longer are - Lancaster for instance. But any fisherman knows that the times when salmon will enter a river system depend on the tides, and a fisherman fifty miles inland might well want to know the time of high water at the nearest river mouth to calculate his best times of going fishing - not that it ever seems to make much difference, but salmon fishermen need to believe in something. A seaport clockmaker had obvious reasons to incorporate a tidal dial into his clocks, for not only did many make their living on the seas, but the lives of the whole community were dependant on the sea for their livelihoods - whether from fishing, or merchant shipping or naval shipping. Also of course much inland trade went by river, where tidal times might also be needed for deep enough water, and fords had to be crossed at the lowest possible water. A clockmaker at Newcastle might not only incorporate a tidal dial for Newcastle itself, but maybe also a second one for the port of most contact. This second tidal pointer (there could be three or four before they became too cluttered) was usually adjustable and could be moved at will to read for any port of choice. If a Newcastle merchant had trade contact with London, the second tidal indicator could be set for London - or Bristol, or anywhere else, provided one tidal time for that port was known, or was taken from a tides table. That second or third pointer could be set by the owner himself and changed at will. By request a clockmaker could always make a clock showing permanent indication for three (or more) specified ports such as Newcastle, London and Bristol. I once owned a clock which showed High Water simultaneously at six different ports worldwide - Gibraltar and Goree, London and Brest, the Ness and Bristol. The clock was made in the 1750s by Richard Hackett of Harringworth in Northamptonshire, which is about as far from the sea as you can get in this country. Some years later I came across a second clock by the same maker, also with multiple tides, though only four on that one - Philadelphia, London, Amsterdam and Bristol. Was this man a genius? Not really, but he certainly understood tidal times better than I do. I tried to examine this first clock's indications aided by the customer who bought it from me, who happened to be a pilot guiding ships in and out of Dover. Our first difficulty was that we could not agree on the location of the places - there were at least two Gorees, several locations called the Ness, and even two Gibraltars! Hackett would have had access to tide tables, which pilots used both then and now. All he had to do was to make his clock show the tidal times he found in the tables, as near as was mechanically possible anyway. Sounds easy enough, but I once borrowed a book of tide tables from the office of the Royal National Lifeboat Institute, which happened to be located near my home. I found them utterly and totally bewildering, and knew instantly why pilots require serious instruction during their training. We finally supposed that the clock showed high water times within about 45 minutes of accuracy, to the nearest hour more or less - most of the time! Hackett's four-tide and six-tide clocks pale into nothing when we look at one of about 1730 which exists, made by Christopher Pinchbeck of London, which shows simultaneous tide times in thirty different seaports! 3. Rolling moon of the later type with landscapes between the moons made about 1770 by William Fenton of Newcastle on Tyne, also incorporating High Water times. 15th lunar day, high water at 12.00. Closer view. 4. 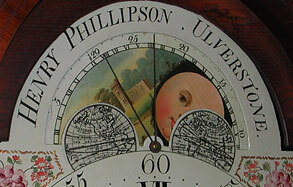 Rolling moon of the later landscape/seascape type on a painted dial clock dated 1806 (numbered 1495) by Henry Phillipson of Ulverston, Lancashire, incorporating tidal times. Here it shows the 23rd lunar day with high water at 4.00 (secondary pointer showing 28th lunar day with high water at 8.00. Closer view. Reflecting on Richard Hackett's relatively simple six-port tide indicator, I cannot but wonder what actual use it could possibly have been. If you live a mile from Bristol Quay, or twenty miles even, it might just benefit you to know the time at which your vessel could set sail. But if you lived in the same place and could read the time of High Water at Philadelphia or Brest, what possible use could that knowledge be? Presumably Hacket was giving those port times in local time, i.e. time at the port in question, being the only times he would glean from tables. I suppose it is just vaguely possible that a merchant with several vessels at sea, or a naval admiral, might like to know local tide times so that he could instruct his ships to set sail on the morning tide. But if the same man had a ship or ships making for Brest or Philadelphia, that knowledge would be of no use whatsoever, as he would not even know what day his vessel might arrive, let alone on which tide. It might just have pleased the conceit of a merchant, chatting over business ventures in his company offices, to have been able to turn to the clock and announce: 'High Water in Philadelphia at three p.m.'. That might have suitably impressed his rivals. Discussions on Hackett's six-port clock finally resolved that all the named ports were major naval bases at a time of the wars with France. If some admiral was plotting how to coincide naval movements, or a naval ambush perhaps, then maybe such a clock would have been useful. But what was an admiral doing in Northamptonshire, as far from the sea as he could get, and does the existence of two such clocks by this maker suggest two different admirals, or just one eccentric one, who loved clocks and plotted war games in his retirement? Or are there more Hacket tidal clocks still to surface? Today a moon dial is an interesting and amusing feature, often giving the pleasure of constantly changing landscape and seascape scenes between the moons. But we don't really need it. Why then was it so often fitted as a feature in the past? There are several reasons, most of them nowadays obsolete. One fairly obvious reason is to help see one's way by night before the days of street lighting. Social gatherings would tend to be held around the time of full moon, so that guests could see to travel by coach. Anyone who has tried it will know that on a clear moonlit night it can be as easy to see without the aid of lights as by daylight. A 'hunter's moon' is one where it is possible to shoot at night such creatures as rabbits and foxes, which are more active nocturnally. Fishing for sea trout is easiest by a moonlit sky. A 'harvest moon' was a bright, perhaps full, moon, which allowed work to continue well into the night to get the crops in while the good weather held. Gardeners and farmers of the old school would sometimes sow crops or plant potatoes by the full moon (or was it a new moon? ), because it was believed that germination was more successful, something recent scientific tests claim to have upheld. So there were many reasons for having a moon dial on your clock, most of them lost to us today. Most moon dials take the form of a rotating disc passing across the arch of the dial. This is called a 'rolling moon'. Two moons appear on the complete dial, but only one is visible at any one time, the other being hidden behind the lower section of the dial. Tidal times are usually set just inside the perimeter of the same disc. For more than one tide, separate adjustable pointers are used. To indicate several tides simultaneously there are usually cut-outs in the arch, which allow times to show through separate boxes. The earliest moons (from about 1710) were on brass dial clocks and consisted usually of a circle with an engraved disc passing behind to show the appropriate phase. This could be sited below XII on a square dial or in the arch of an early arched dial. The arched version sometimes carried tidal times too, though not usually on the square dial form. Rolling moons appeared first on brass dial clocks about 1730 to 1740 and were usually of what I call the 'starry sky' type, in that they had a blue/black night sky set with stars and comets between the two moon faces. The moon discs could be engraved or painted. Gradually they developed into the more usual painted form of rolling moon, whereby the space between full moon faces was painted with landscape scenes, or sometimes with a landscape alternating with a seascape. A seascape is always more interesting as a galleon shows the clock's age, whereas a landscape could be a pretty country scene of any period. These landscape/seascape versions appeared on both brass dials and painted dials. But there are other kinds of moon dials. A 'ball moon' is an unusual variant, whereby a brass ball with one half silvered and one half blackened is set in the arch of a clock. At any one moment the silvered section shows the moon's phase, which can be anywhere from a slim crescent to a full moon. This is sometimes incorrectly called a 'Halifax moon', a term more correctly used to describe a 'rolling' type of moon when set onto a square dial and therefore positioned below then XII numeral. A ball moon can also sometimes have tidal times too, but that is unusual. 5. 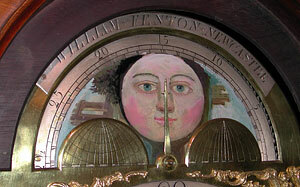 Thirty-hour clock of about 1740 by William Northrop of Wakefield, Yorkshire, with typical 'penny moon' below XII, here showing just coming up to full moon (15th lunar day). This is sometimes known as a 'Halifax moon'. Closer view. Yet another type of combined moon-and-tide dial appears, though this is very rare. The arch contains a painted scene of the night sky, with the moon represented by a small ball projecting through the dial, half black and half white, turning just like the larger 'ball moon' type. Below the sky is a coastal landscape with cliffs and a seashore, in which a blue panel, representing the sea level, is capable of rising and falling against the cliffs as if with the tide. This system was supposedly invented by James Ferguson, a noted scientist, and is said to have been first incorporated into a clock made for the Dock master in Liverpool in 1764, and published by him in 1771 and 1773 in a simplified form. This full version of the moon-and-tide system is seldom seen, but I have occasionally seen the rising tide system with a rise/fall shutter on its own in clocks. 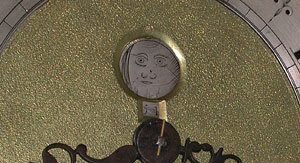 A moondial longcase clock tends to be amongst the most costly, both today and also at the time of its original making. Those with tidal dials as well were, and still are, often more costly still. Moondial clocks were always in the great minority, and today tend to be in the greatest demand, so there is a certain scarcity factor with them, the more so with tidal dials which are scarcer still. A moondial clock (with or without tides) contains far more parts and more gear work in the making, which clearly had to be paid for. But there is more to it than that. 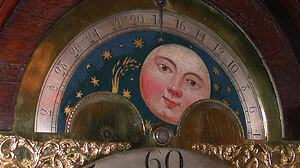 A clock with a moon was usually bought by a wealthier-than-average customer, who wanted the best. It follows therefore that other features of the clock will also be costly ones - perhaps a fine mahogany case, perhaps exceptional amounts of inlay or fretwork, perhaps a particularly handsome dial ... In other words a moon dial or tidal dial (or the usual combination of the two) may have been an optional extra onto what was already a costlier type of clock and very much an up-market clock anyway. A clockmaker was willing to make what the customer wanted, and most of his work was made to order rather than his making a clock on spec in the hope that somebody might walk in and buy it. It is therefore just about conceivable that a contrary customer might opt to order an otherwise cheap clock, which also had a moon and/or tidal dial as an extra. In fact we do sometimes see very honest and sturdy oak country thirty-hour clocks, sometimes single-handers even, which have moon dials. The moon was important to country folk, usually much more important than minutes or seconds, and such a clock would show moons but neither seconds nor minutes. But when I suggest a moon was usually an optional extra on an already costly clock, I am thinking of grander eight-day clocks, often in mahogany or with considerable mahogany trim. I have seen eight-day clocks, even sometimes in mahogany or mixed woods, which were pretty poor, miserable things yet still had moons. But that was generally not the case and most clocks which carry a moon dial, or moon and tide dial, were top of the range models of the particular type in question. A moon dial clock was not always top of the range, but if you wanted a top-of-the-range clock, it had to have a moon. If you wanted the best available dial type, then it would have a moon, and maybe even tides too. This is why many moon dial clocks are expensive today, because they represent the best of their period.